It's been said that boys are hungry little noises with dirt on them. 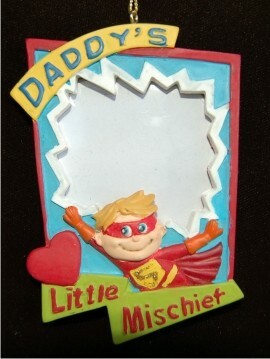 That about sums up the spirit captured in the daddy's little mischief personalized frame Christmas ornament in its handsome, cheerful colors. We add the little guy's name and a year to the back of these photo frame ornaments in a hand-lettered font. Arriving in our attractive velvet gift bag, the daddy's little mischief personalized Christmas ornament will be a thrill to both Dad and the little fellow starring in the photo! For my brother and his son Dec 18, 2014 Kimberly H.